This ethnic family group encourages personal identity and cultural awareness. Perfect for the classroom or day care center. Set of six. 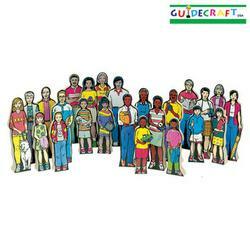 All 24 pieces includes all four multicultural families. Method of shipping is UPS Standard. Materail: Wood, silk-sreened.